Crying into my muesli was familiar territory in the days when hormones were more rampant, usually activated by the loss of some love or a response to the all-encompassing despair that used to dog my footsteps. The loves are gone and the despair moderated so the tears were a surprise. Not a response to pain, more a liquid overflow of emotion about an imprint on a revamped interior. 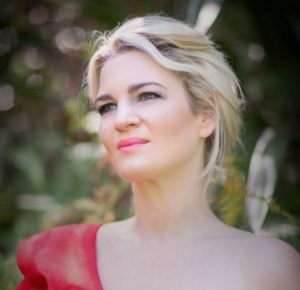 Heroes and Heroines it was called, with Anna Pierard, local mezzo-soprano recently returned from Europe with equally talented husband and entrancing offspring in tow. She strode onto the Hawke’s Bay Opera House stage resplendent in tuxedo; homage to the castrati who, in previous times, would have sung her opening pieces. The medical snip that produced angel voices in men is now a tad unfashionable, leaving the stage free for women to wing their way into open hearts. This was no solo performance. David Harper, another New Zealander who tames pianos and singers across the world, slid smoothly onto the stool of the glistening grand. I swear those keys reached up for him when they sensed whose fingers waited to bring their individual tones to a symphony. Anna slid the silken wrapping off 14 operatic treasures that traversed the chaotic, tragic and sometimes triumphal human condition. The heart-wrenching passion of her voice along with a flick of the head, a facial expression or a reaching towards us was enough to let us in on the story when she sang in another language. The symbiotic partnership between Anna and David polished over years of rehearsal, performance and friendship was as tantalising as their individual performances but gone too soon. Suddenly we were at the intermission that included a random conversation with my friend about what God might be. Strange how that question keeps popping up. Two costume changes in the second half, a couple of encores and it was over. As we stood waiting for the audience to move I could hear comments about this or that piece from people who seemed to know things about opera. Saying I felt a delicate imprint seemed ludicrous so I said nothing except no to coffee and cake as we spilled out into the cold night. At home in bed, SpiritedK9 the Chocolate Labrador snored gently after curling herself into my shape to share warmth. Picking up a book in the usual rite to capture sleep, I only managed a few pages before it was discarded in favour of staring sightlessly at the wall. I felt empty, but not the emptiness of despair, although this great expanse could, if you were anxious about the ever-present void, be mistaken for that. It was more as though I was aware my insides had been outfitted by a minimalist designer. All unnecessary props and furniture had been removed. The room was white, not the arctic kind, more Resene’s Spanish version with a redeeming tinge of warmth. Light, gauze curtains, too long for the windows of my mind pooled at the floor moving slightly in the warm breeze of this inner world. No clutter. Nothing to distract or disturb. And no memory of the music, or no memory that I could identify or understand. Just a delicate imprint, as though a finger had been pushed gently into the drying plaster of the new wall. Empty yourself say the sages of the great religions. Better still; lose yourself in order to find yourself. For what will it profit a person if they gain the whole world and lose their own soul? Indeed, we might wisely agree before popping down to the shops for a bit of retail therapy. Emptying is easier said than done and significantly more frightening than an overdraft. Growing up, I noticed that my folks used to state a belief in those religious ideas and do the opposite. Our lives were permanently cluttered with things and tasks. Once we were home from school or work there was always more to be achieved. Helping my mum bake for the church fund raiser, trailing to the church the funds were being raised for and for dad, being part of the committee that organised the whole wretched enterprise. The void was full of doing; the Protestant work ethic writ large, which now makes me suspicious of most worthy causes. Inside the house, organising clutter was a godly pursuit. We used to say that mum tidied up before we made a mess, banishing to the garage anything of doubtful purpose or unable to be folded neatly in a cupboard. A bit like my sins I thought when I eventually summoned up the nerve to contemplate what was hidden away inside of me. Periodically, the family attempted to get rid of whatever was cluttering up our lives. A dumpster would arrive and the ritual of letting go was activated but within stifling limits. My exuberant delight at the possibility of chucking all that stuff and breaking free was reined in by my parents who would inspect every item for potential reuse. Until mum died and dad moved away, that garage stood as a testament to the fear of the void. Emptying is often accidental or forced upon us. If our insides are gouged out by disaster, after a suitable period of staggering dehydrated in the desert we fall upon an internet dating site or a car yard, or, well anything that looks promising. The pain of emptiness pushes us to restock, fast. As an intentional act, emptying can be seen as a suicide of sorts; a self-initiated dismantling of the internal clutter that puffs up the public façade. Suicidal because clearing out the internal garage may expose our self as an illusion, despite a slick internet presence that suggests more. To live a solitary life is like walking into the desert. No-one may call, no-one will know the drab minutiae of our day apart from beloved pets and they won’t tell. The sand may close over us leaving no trace of our existence. Then, the slippery inner critic announces, it’s true that your life, to this point anyway – who knows about tomorrow, has been a pointless affair. Anna inhales, stabilising the vessel that holds the imprint. David lifts his hands to alert the expectant keys. She sings, and truth is breathed into the void. Like any Spirit, this is a creative force able to be shaped but utterly resistant to capture. Fragile in its intensity like the desert sand. Exquisitely formed, but fleeting. Gone, almost as soon as it is born. Apart, that is, from the small mark made on the drying plaster of my new minimalist interior. The unique neural fingerprint that is the image of God. Also featured on the On Being website as Truth Breathed into the Void. This book is well worth reading and, if we let down our defences about what constitutes religion, spirituality and God, we could use their research to seriously change our world for good. This article is my favourite on the site, it makes great reading and is thought provoking, I was privileged recently to attend the Progressive Conference at St Andrews and have only just got around to having a look at your website. I too was reared in a fundamentalist church and couldn’t wait to get away to ChCh to university, but wasn’t able to cast that off there. However I had an option of enrolling in Religious Studies I and heard a version of church history hitherto unknown to me, AND the Comparative Religion blew my mind , so at 24 years old I set out to travel/live in SE Asia and saw and experienced a myriad of religious practises that my background had taught me were not The Way, as the only way was through Jesus the Lord. It was daring and exciting to see what was happening in Buddhism, Hinduism, Sikhism, to a limited extend, Islam, and various meditation traditions. Then came many years of no church attendance in NZ ( for too many reasons to outline here) but 4 years ago I found a progressive church and now am in a non judgemental environment and allowed to express my doubts and questions and not be put down or judged to be a stroppy female. Thanks for the great feedback and for telling part of your story. I think being educated well about religions is one of the best ways to illuminate the riches within traditions without people feeling the need to be bound by them. And travel helps enormously as well. Great to know you’ve found a place that is open and welcoming. My dream is of community places that are open to all kinds of traditions and ways of being, that operate as a space holder and nurturer of the holy without having to hold fast to one particular version. Beautifully witten, expressed …this is great stuff Sande … resonated with me. If you know Anna, you’ll know something about the impact this performance had on me! This must be some of your finest Sande? Now I want nw to linger over it. I admit to it being one of my favourites, perhaps because writing doesn’t always hang together so well, no matter how hard one works. Sometimes the muse has much more to do with it than we realise.